BANGOR, Maine — At 6-foot-3, talented senior Bailey Donovan is one of the state’s most dominant centers. 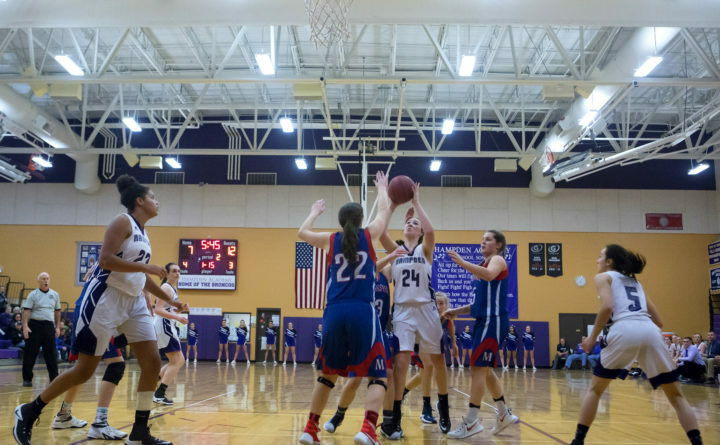 But her Hampden Academy teammates proved that they can get the job done without her during Thursday night’s game against Bangor at the Red Barry Gym. Donovan didn’t play the final 3 minutes, 56 seconds of the first half due to foul trouble but her teammates closed out the half with a 7-0 run that broke the game open and the Broncos went on to post a 53-41 victory over the cold-shooting Rams. Class A Hampden Academy won its fifth straight game and improved to 8-1 while Class AA Bangor fell to 5-5 after winning three of the previous four games including a 45-34 road win over defending state AA champ Edward Little of Auburn. Class A Hampden Academy was leading 21-16 when Donovan departed but the Broncos held Bangor scoreless the rest of the half. Meanwhile, Amelia McLaughlin nailed a jumper from the left corner, Camryn Bouchard hit a 3-pointer from the same corner off a Sydney Hodgdon pass and Alydia Brillant canned a jumper from the top of the key off a Bouchard feed as the Broncos took a 28-16 lead into the intermission. Bangor made a valiant comeback from a 15-point deficit by scoring eight unanswered points spanning the third and fourth quarters but the Broncos answered with a 7-0 run that sewed up the victory. “When Bailey is in foul trouble, we still have a lot of other weapons we can use that you didn’t see last year,” said 5-10 junior guard-forward Brillant, who turned in an impressive all-around game with 11 points, five rebounds, two assists, two steals and a blocked shot. The Broncos graduated six seniors off last year’s Class A North championship team. “We definitely have other people who can score. We can move the ball around and find other (open) people. It works out for us when other teams try to take me away or I get in foul trouble,” said Donovan who finished with 17 points, 12 rebounds and four blocked shots, all game-highs. Bangor junior guard Rowan Andrews said they didn’t adapt to Hampden’s lineup when Donovan came out. Donovan and her mates dominated the paint, out-rebounding the smaller Rams 32-19. Coach Nick Winchester’s Broncos used a 14-3 run bridging the first and second quarters to create a 17-8 lead behind Donovan’s seven points which included a three-pointer. Bangor cut the lead to five on three occasions with the last being at 21-16 when Donovan departed. Hampden Academy built its biggest lead of the game in the third period, 37-21, but Bangor went on a 14-5 spurt to pull within seven behind Maggie Cowperthwaite’s four points and Riley Andrews’ basket and assists on Olivia Sharrow’s basket and sister Rowan Andrews’ three-pointer. Bangor could have pulled even closer but missed three free throws and the Broncos went on their 7-0 run triggered by a Camryn Bouchard three-pointer off a Brillant pass that made it 46-35. Brillant added three free throws to expand the lead to 14 with 4:16 left. Bouchard and McLaughlin finished with 10 points and three rebounds apiece for the Broncos, who shot 48.5 percent from the field (16-for-33). Hodgdon had a game-high three assists to go with three points. Libby Fleming’s 12 points, four rebounds and two steals paced Bangor. She was one of three Rams to foul out in the fourth quarter. Rowan Andrews had seven points, two steals and two rebounds and Cowperthwaite contributed seven points and a team-high five rebounds. Riley Andrews had four points, two rebounds, two steals and two assists and Abby Fleming had four points, two rebounds and two assists. Bangor shot just 31.3 percent from the floor (15-for-48). “They’re a very good team,” said Nelson. “When you get behind them, they’re tough to come back against because they’re pretty methodical and they made the shots they needed to make. “Whenever we tried to come back, we’d leave somebody open and they’d make a big shot,” added Nelson. “We didn’t play as well as we usually do or shoot the ball as well as we normally do,” said Rowan Andrews.